CasinoPop is a vibrant gaming brand that launched in 2016. 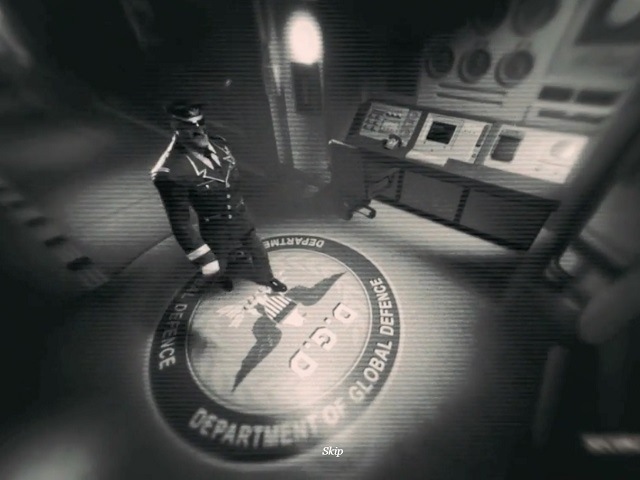 It has the ethos of putting the player first, while still being a profitable company. This means CasinoPop features some distinctive gaming concepts, in addition to classic video slot and casino options. With full Maltese and UK licences, CasinoPop has a retro style that's sending slot players wild. When it comes to software from hot developers in the slot world, CasinoPop has gone to town. Players enjoy an excellent range, including Play'n GO, Microgaming, Quickspin, Yggdrasil and Net Entertainment – with classic slots as well as the very latest releases. 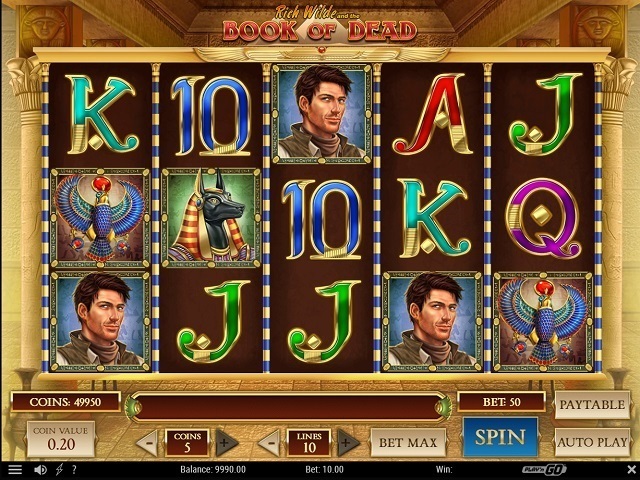 Special mention should be given to the slot and casino developer RedTiger, which has been given its own gaming tab. The gaming lobby is intuitive to find and navigate, built on a robust platform that's reliable via all devices. The option to search for slot games made by one or more developer is also a nice touch. The CasinoPop brand has a distinct retro atmosphere and look. While it offers high-class gaming options across the genres, it doesn't try to appear like a Vegas casino, with images of tables and stylish clientele on the homepage. Instead, it looks fun, with an emphasis on the site's slot machines, jackpots and special rewards. In many ways it feels a little like an online bingo website – punters feel good playing here. As for CasinoPop's navigation and gaming lounge, it's simple to find and contains 11 sub-tabs once inside: Featured, Latest, Top, RedTiger, Jackpots, Slots, Classic slots, Table games, Live, All and Other. While that may seem a lot, the site offers a large range of games, so it actually works well and doesn't feel over-crowded. With plenty of white space on the screen, both laptop and mobile players will quickly find what they seek via the red category tabs and filter by title and vendor options. And if they can't, live chat is available at the bottom of every page. The site's top navigation bar features the Home button, Games, popZone (VIP club) and promotions, which makes for clean-cut browsing. And with a registration banner and offer always on the homepage, it’s easy to get started. 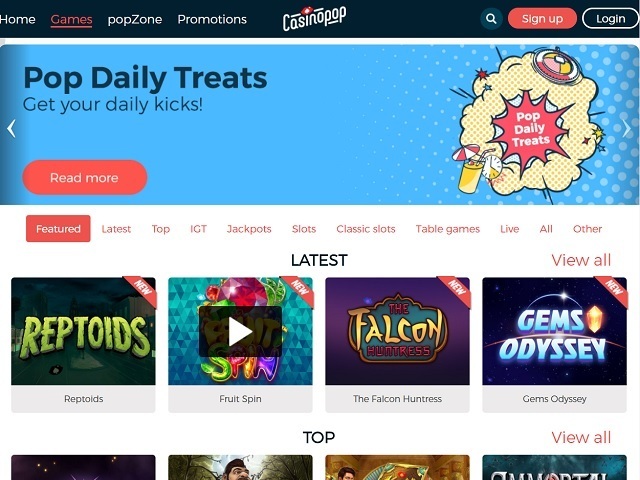 The CasinoPop brand has teamed up with an array of game development talent, to give slots players one of the best experiences on the internet. The site contains in excess of 800 titles and it's constantly growing, with well over 500 top online video slots. It's interesting that CasinoPop gives RedTiger a special position with a category all of its own – a cool game developer the site is keen to promote to players and marks CasinoPop out as a slot site eager to be different. CasinoPop is slot machine heaven whether players want old classics, huge progressive jackpots or the latest interactive marvels. But it's also possible to hit the casino and live casino instantly for more sophistication. Does CasinoPop Offer Progressive Jackpot Slots? The site features more than 20 jackpot machines, inclusive of leading progressive jackpot slots such as Major Millions and Hall of Gods. 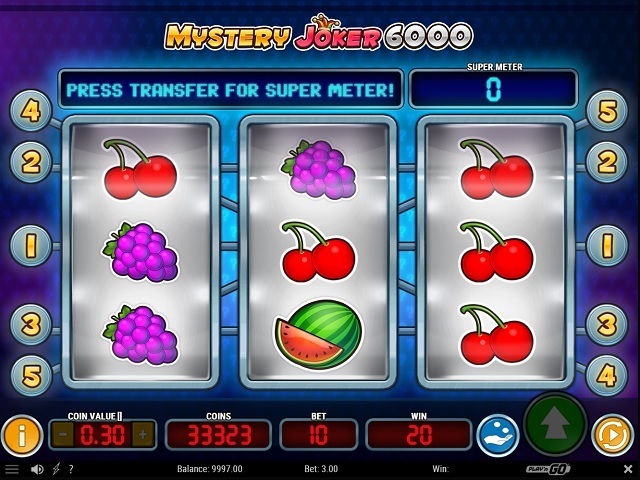 Jackpot slot games get a tab of their own within the games lobby, while the real-time jackpot pools can be seen by scrolling down the homepage. Can Players Demo CasinoPop Slot Games for Free? Mobile slot players who love to play video slots free of charge will be in heaven at CasinoPop – with a massive range of games free to play and demo, without needing to register for an account. Banking at CasinoPop is fast, uses the latest secure technology and enables deposits and withdrawals via a range of methods – Visa, Mastercard, Neteller, Skrill, Paysafe card and Trustly. The one downside is for Paypal users, which isn't currently available. The site's deposit limits range from 15.00 to 5,000.00, while eWallets like Skrill offer withdrawals within five to 12 hours. Banking options at the site have a 2.5% fee, which is something for players to be aware of. CasinoPop features a popZone tab at the top of the site, giving access to a loyalty programme with multiple levels for players to climb. One of its coolest elements is the popSpin game, which gives players free plays and progressively nicer rewards as they level-up. As a legitimately rewarding bonus, it's one that's gained much kudos among slot regulars at the casino. In addition, the site offers a constant registration bonus, plus weekly and monthly competitions and promotions. As a site that truly aims to make things special for players, CasinoPop couples the latest gaming security tech with 24/7 support via email and responsive one-click live chat. Smallest deposit to take part of our bonuses is €15 (unless otherwise specified). All deposit bonuses (unless otherwise stated) has a wagering requirement which is based on the deposit amount plus the bonus amount. Players from the following countries are not eligible for our welcome bonus and / or other bonuses unless otherwise stated: Poland, Greece, Hungary, Bulgaria, Romania, Croatia, Ukraine, India, Pakistan, Portugal, Indonesia, Russia, Czech Republic, Slovakia and Latvia. Each offer is only valid the same day as it was sent unless otherwise stated. The following games are restricted until wager requirements have been met: Jackpot 6000, Pearls of India, Dead or Alive, Kings of Chicago, Simsalabim, The Wish Master, Devil’s Delight, Robin Hood, Castle Builder, Jurassic Park, Super Monopoly Money and Tower Quest. Players can request a withdrawal of their deposited amount prior to fulfilling the wagering conditions. Please note that when that is done the bonus amount and associated winnings will be forfeited. After 30 days all deposit bonuses and free cash bonuses will expire. Unless otherwise stated: Free Spin bonuses has a wager requirement of 35 times. Bonus money and the winnings from bonuses will be forfeited when the bonus has expired. For any bet, placed bets are deducted from the cash balance of the player. If no cash balance is left then the bet placed is deducted from the bonus balance of the player. Until the wagering conditions are fulfilled the max amount you are allowed to bet is €5 ($5, £5, 50SEK) per game round. This includes doubling of wins after the game round is over. For example, doubling the win from a game round by choosing red or black. Bonuses can be removed before the wagering conditions are fulfilled. Please contact customer service or use the "Forfeit bonus" on the "Bonus" page under "My Account". It is only allowed to have one active bonus at the time. You cannot stack deposit bonuses. The maximum payout amount that any customer can request to withdraw after winning any amount related to any no-deposit free spins is €50 or the equivalent in other currencies. Any amount above €50 will be removed from your player account upon your withdrawal request. Gameplay with bonus money on games which allows you to reach the bonus feature mode using bonus money, to then continue with real money after the bonus is forfeited or lost, are not allowed. This rule means that gameplay with bonus money in games like (but not limited to) Big Bad Wolf, Jackpot 6000, Pearls of India, Dead or Alive, Kings of Chicago, Simsalabim, The Wish Master, Devil’s Delight, Robin Hood, Castle Builder, Super Monopoly Money and Tower Quest will result in winnings from those rounds being voided and the account possibly being closed. CasinoPop.com reserve the right to void any bonuses and/or winnings obtained by fraudulent behaviour. CasinoPop.com reserve the right to update these rules at any time. The 100 welcome bonus free spins are handed out 20 per day the first 5 days on the games Starburst and Lights (you choose). So you need to login each of the first 5 days to get them all.